This summer the sports editor for The Nation released a new book titled, Brazil’s Dance with the Devil: The World Cup, the Olympics, and the Fight for Democracy. As an advocate against the current method of which mega-events are operated this book was an obvious choice for me. I picked up this book with very little knowledge about Brazil in either its current or past form. Zirin manages to weave together a complex political and cultural history in a way that situates the reader well to understand the conundrum that the timing of the 2014 Brazilian World Cup and 2016 Olympics pose. All in all, if you are a regular reader of Zirin’s work I don’t think anything in this book should come as a surprise. In fact, it essentially reads as a lengthier version of Zirin’s pieces for The Nation. With that said, if those who are already immersed in the politics of mega-events are looking for new epiphanies, you won’t find it in this book. However, that is not to say that there is no value in Brazil’s Dance with the Devil. While the main contribution may not be in new knowledge, per se, Zirin’s ability to package what academics have known for decades into a palatable read for the average-Joe is extremely valuable. It is an important conversation starter and a book that any sports fan should pick up. I have found that, as a social sciences student, of all the party topics to avoid criticism of the Olympics and other mega-events generally spurs the most emotional reactions. That’s right, it’s not issues of gender equality or racism, but mega-events that create heated debates. Perhaps, this has more to do with the crowds that I associate with rather than the issue itself, but it seems very difficult for lovers of the Olympics and World Cup to hear criticism against such spectacles. I should preface this with the fact that I like mega-events, because I like sports. What I do not appreciate are the ways in which these mega-events are run because they are blatant examples of financial gains and short term amusement over long-term social welfare. Mega-events are the glitter used to hide the rot of a city. They are a veneer used to draw on feelings of nationalism while hiding exploitation and displacement. Are celebrating in the Olympics and World Cup fun? Sure. But who are they fun for? My contention has always been that the costs do not outweigh the benefits, economically or socially, and I think that Zirin’s book outlines this fact very well. Zirin makes very clear in this book that Brazilians were never against the World Cup or hosting soccer in their country. Soccer has never been the issue. 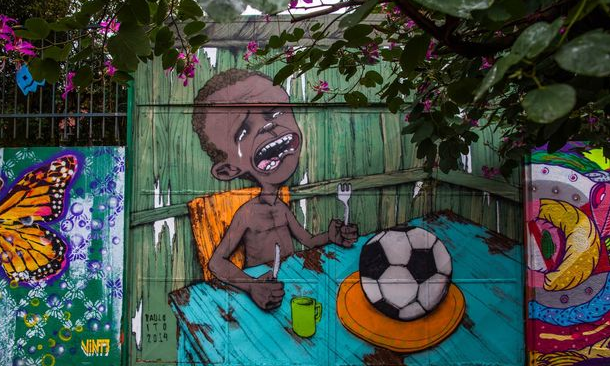 The 60 something percent of Brazilians who took to the streets to protest the World Cup were against FIFA and it’s exploitation of Brazilians. You see, just as you would tidy up your house before guests come over, so too must a city be “tidied” in order to receive international guests. 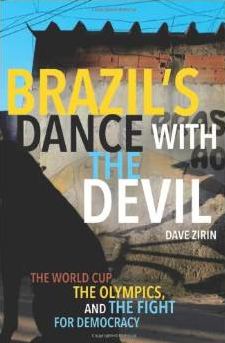 Brazil’s Dance with the Devil describes how the country’s most disenfranchised (those living in the favelas) were displaced in order to build new stadiums and transportation infrastructure. Where were they moved to? Some were moved two hours away from their homes which made work impossible with no way or means of commuting. But the question should not be where were the moved to; rather, we should ask why does anyone have to move for a temporary event? Mega-events are all fun and games until someone loses their home. But hey, as long as it’s not your house, who cares right? Also part and parcel with mega-events comes the ability for organizations like the IOC and FIFA to create states of exception. In other words, what FIFA says, goes. Who gives them the right to make and enforce new rules? FIFA does. It’s like if you invited your neighbour over for drinks and then your neighbour started re-arranging your furniture, going through your clothes and throwing out whatever he didn’t like, eating all your food and then taking money from your wallet for his troubles. You’d be like WTF?!?! Right? But when the IOC and FIFA roll into town we put down the red carpet (over all those people you don’t want the rest of the world to know actually exist in your fancy country) and say “have at’er!” The IOC and FIFA tell us that their presence will create jobs, money, and opportunities that would otherwise never have existed. What they fail to tell us is that those jobs are temporary and often times dangerous. 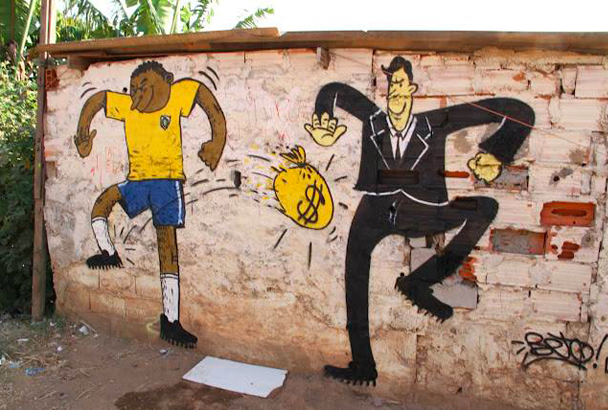 In Brazil (as in Qatar), the labour situation has been equivalent to that of slave labour. Passports can be taken away and food with held in order to “encourage” productivity and loyalty. The private sector jobs that are created eliminate the opportunity for long-term public sector jobs. Now, slave labour doesn’t happen with all mega-events. In Vancouver, the issue was more about displacement than it was on labour rights but that is because you can’t get away with the same things in Canada that you can in Brazil or Qatar. Therefore, even though events that take place in “First-world” nations may seem to have only minor social and economic costs, these differences are greatly exacerbated in the so-called developing world. Oddly enough, these are also the places where we are sold the development potential of such mega-events. Most of [the money spent on World Cup and Olympic modernization] will be spent on a cable car, even though most favelados will not use it. Why are they building it, then? Mauricio’s answer is logical as it is distressing: “A lot of people get a lot of money from public works projects. It looks good for the city too – even though it’s not good for the community. This cable car is not for the residents. It make the city look clean, without the image of favelas and poverty. It’s for the tourists. It’s for the tourists. Is that the kind of city you want to live in? One where visitors are privileged over the voting and working residents? While I take issue with the amount of money spent on mega-events, we must recognize that there are two sides to every coin, and when we pay for the Olympics and World Cup we never flip over that coin to see the other side. We fail to see that every dollar that goes into a “FIFA-quality” stadium says to the disenfranchised that they don’t matter as much as two-weeks or four-weeks of fun and celebration. We move people out of their homes so that we can party. We criminalize people to ensure that any buck made goes into pocket A or B but never C. We play with people’s lives as if it is a game and we are okay with them merely being pieces to be moved. If the competition only took place in the stadiums that would be fine, but the fact of the matter is that wherever FIFA and the IOC go the game is rigged in their favour. Zirin highlights that even though it is excited to be invited to the game, little do we realize that the game is never for us.